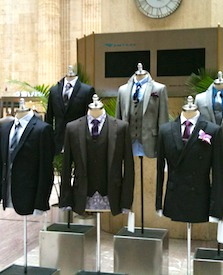 A triumvirate of Indochino custom suits on display during the Traveling Tailor pop-up in Union Station's Grand Hall. You can book an appointment online to try on those (and other) suits. It’s a good time to be a man with precise suiting tastes but a modest budget. As exciting as it is that Chicago’s got its own Brunello Cucinelli brick-and-mortar shop on Rush street, if you don’t have four large (or more) to buy custom, cashmere suit, there are other options that might be sans the finest wool in the world but still completely custom. Collar at your boy. Indochino makes custom shirts too. One such provider of budget-minded made-to-measure suits is Indochino. It is based out of Vancouver and Shanghai, but its storefront is online only. Now, we’ve voiced reservations about sizing clothes up on your laptop instead of going to a store and trying them on. And when investing in a suit, surely you’d want to try the thing on, touch the fabric, examine the construction, and make sure the pants don’t make a swooshing sound when you walk. 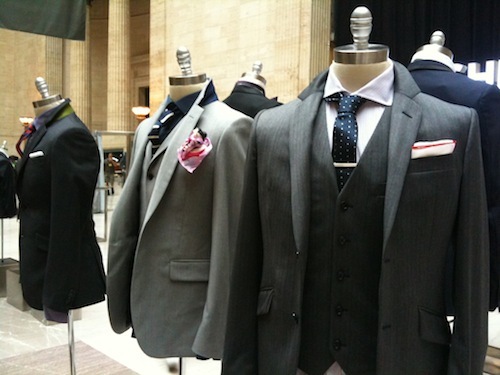 However, Indochino has brought its custom-suiting process to Chicago for a limited time. The clothing maker has temporarily set up shop in Union Stations’ Great Hall (it’s a rather large pop-up shop, you can’t miss it, no matter how fast you’re walking to catch your train). This is part of Indochino’s Traveling Tailor series, where they bring the suits to the people, and the people can get fitted and styled and purchase Indochino products. Indochino’s Traveling Tailor began its Chicago stay this past Tuesday. The pop-up goes until Saturday Monday evening. You can book an appointment online, and at the time this post was written, there are still several appointments available on Thursday through Monday. We went for a visit on Wednesday morning — below you can read what to expect during a session with Indochino’s Traveling Tailor. This is pretty straight forward, with one caveat: Most suit fittings go on in private rooms. Wood paneling is probably present. Perhaps some Sinatra is being played. But when you’re getting your measurements taken during a Traveling Tailor appointment, everyone hustling through Union Station’s Grand Hall can see you. Now, you don’t have to go during a peak commuting time like we did. There are mid afternoon and evening appointments. Of course, if you like looking important in front of strangers (it’s hard not to look important during a suit fitting, even if you can’t smoke a cigar while doing it), then you’ll enjoy this experience. Right on trend, Indochino offers a double-breasted suit jacket. Collar flipping optional. We were fortunate to have a very energetic and knowledgeable Indochino stylist named Jennifer helping us out during our style consultation. She introduced us to Indochino’s various fabrics, jacket styles, lapel sizes, etc. We were interested in blue sharkskin, which made her happy, as she had recommended the fabric to a gentleman who came before us, but he was a little on the fence about it. We were not. Quick note: Normally, we enjoy having elderly gentlemen help us pick out suits, but Jennifer was a very welcome change of pace. One thing we didn’t know about Indochino was just how customizable its suits were. Any fabric could go with any lapel, button and pocket combination. There was any array of colors to choose for the suits lining. And then there were the fine details, the stuff we really dig. Ticket pocket additions, slanted pockets, flapless pockets, hidden pen pockets. 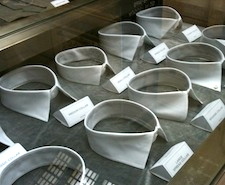 Surgeon cuffs. Pick Stitching. The usual stuff you’d find in fully customizable suits, but not what you’d expect for suits that start just south of $400. If you buy a suit during your traveling tailor appointment, you get a free custom shirt — yeah, Indochino has those too, as well as trench coats that were on display. For the shirts, you get your choice of collar (they even have club — or rounded — collars, which we swear, will have a moment soon, especially if Leo rocks one in the upcoming Great Gatsby). Our entire appointment took a little over 45 minutes. Of course, we are a bit chatty. Maybe your appointment will be a little shorter. Just know if you have the time, and want to have a custom-suiting experience (and no, you don’t have to commit to buying anything), we definitely recommend visiting Indochino’s Union Station pop up.